Just like people, dogs appreciate their independence around the home in order to access their favorite places. And the same goes for elderly cats that are no longer as agile as they were in their younger years. Stairs and ramps strategically placed around the home solve the problem. Initially, elderly pets may need some encouragement. Indoor step sets are carpeted to provide grip and similarly, ramps for both indoor and outdoor use have surfaces that will make pets of all sizes feel safe and secure using. Nevertheless, initially you may need to offer a little encouragement. And nothing spells “incentive” better than yummy treats! Place treats on each step or along the ramp. And once you have successfully trained how to ascend, repeat the process in the other direction to teach how to descend. Having steps or a ramp will also mean your pet will get some exercise using them! 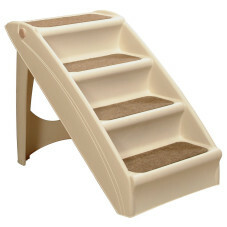 Pet steps are very decorative and it’s a good idea to leave them permanently in position. However, if you need them in several places around the home, some designs such as Pup Step Plus and the Pup Step Lite are lightweight enough to move around to difference places so your pet can always be with you. Similarly, a ramp is an excellent accessory for a dog to get in and out of a vehicle. The UltraLite Bi-fold Pet Ramp is a compact solution that’s lightweight and strong. Ramps can be set up to access a passenger door as well as the cargo area of an SUV. 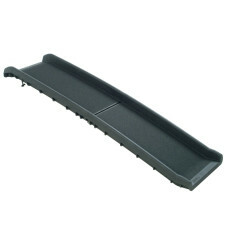 However, affixing a HitchSTEP to your vehicle means you never have to place something in position. 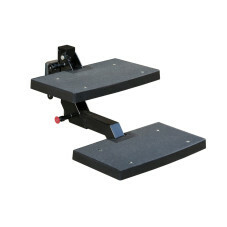 This two-step design can be stowed when not in use can be adjusted to fit the heights of different vehicles and is suitable for dogs up to 200 lbs. Elderly dogs often have difficulty standing up from a sleeping position. 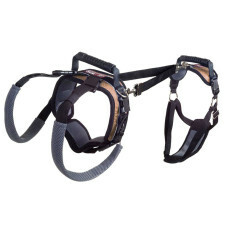 An accessory such as a Carelift™ Harness that lifts the whole body completely from under the abdomen and the hips simultaneously, will offer much needed assistance to get a pet back on its feet and be an active member of the household.